I told you I'd be back (two blog posts in one week--what?)! Summer break is just around the corner for us. I'm freaking out a little bit about having everyone at home again, but believing that God has good things for us this summer, and that I will not go crazy and lose my hair . . . or my mind . . . or both. Sigh. The anxiety is real, friends. I want to have some loose rhythms for us this summer. Daily rest times with some books on CD, play time with neighbors, trips to the library and pool. 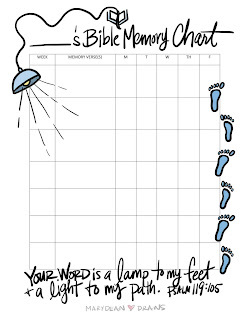 One thing I'm brainstorming is doing some Bible memory work with the kids. I want to keep it light and fun, but we haven't done any memory/Bible work since they've been in school, so I'm hoping the summer will be a good opportunity to introduce more truth to their hearts. 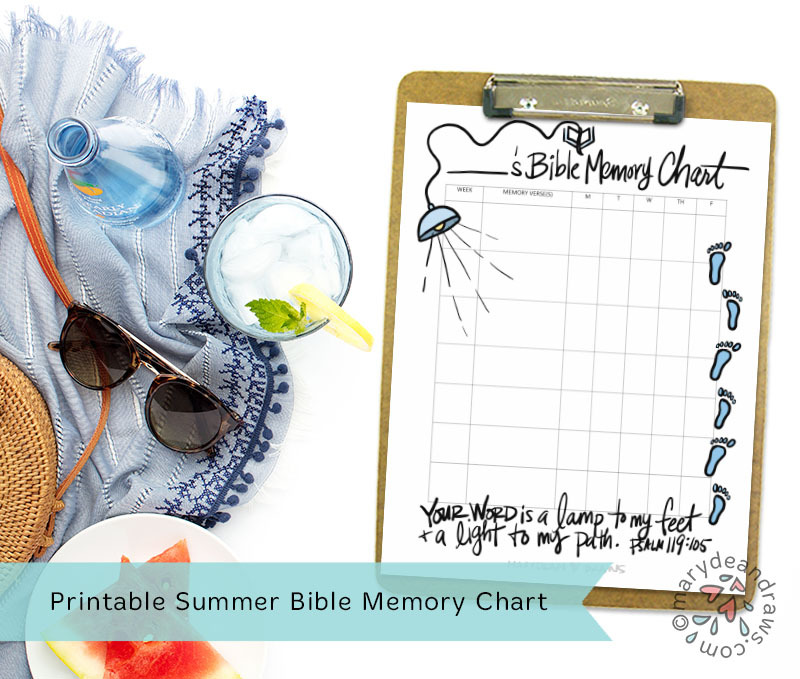 I created a super simple printable Bible memory work chart you can use this summer with your children (or all through the year). MONDAY: Read and repeat x2. Talk about any unfamiliar words. Color a coloring page and post somewhere where you'll see it often (car, fridge, dining room). TUESDAY: Look up the verse in the Bible. Read. Repeat x2. What's one thing this verse is telling us about Jesus? WEDNESDAY: Read. Repeat x2. Write or draw out the verse. 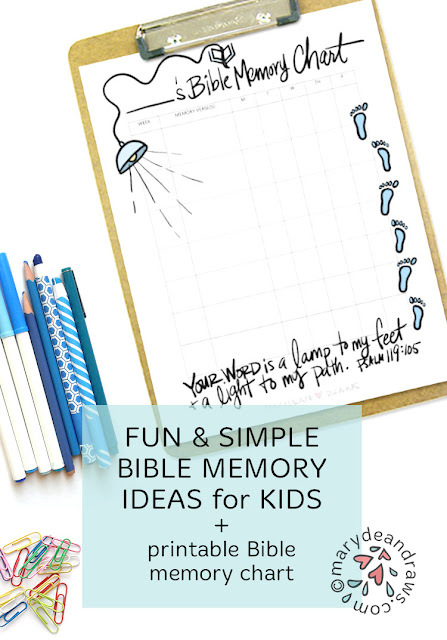 A few years ago, I posted a fun little guide to doing Bible illustrations/doodles here. THURSDAY: Read. Repeat x2. Talk about how this verse might apply to your lives. FRIDAY: See if you can say the verse from memory. Celebrate with a special outing, reward, or treat. If one week is too fast, try memorizing your verse in two. the NEXT MONDAY: Loop back to the previous week's verse. Repeat and then start on a new verse. Continue repeating the older verses each week. If they're old enough, let your child be part of selecting what they want to memorize. 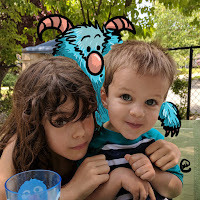 If you need fun illustrations, ahem (🙋), you can use free printables from this blog or choose a pre-made set from the shop. 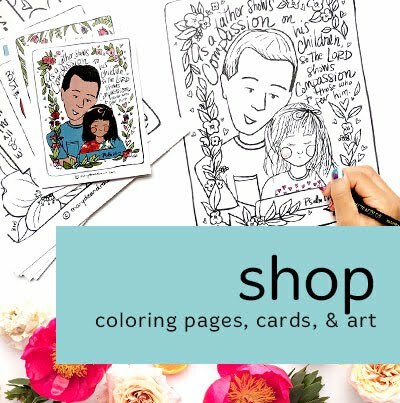 Many sets in the shop include full-color cards and coloring pages. 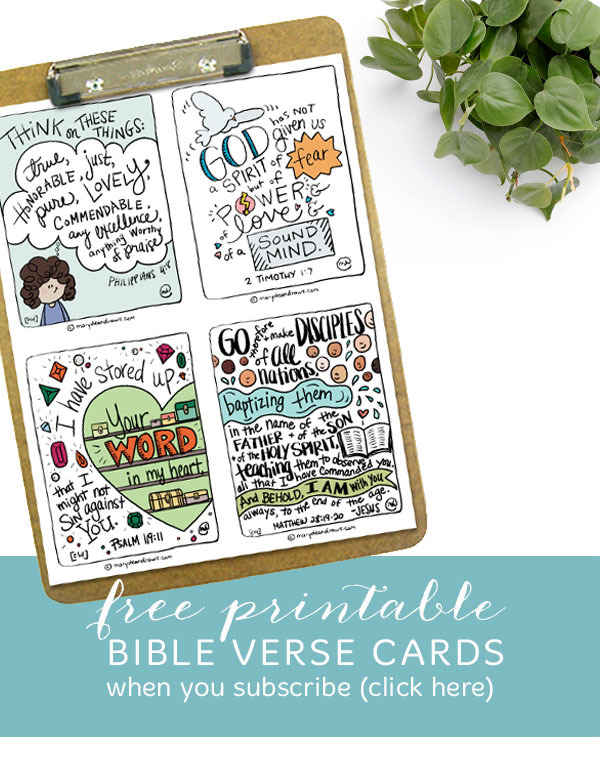 Create a bookmark or notecard with the verse and give it away to a family member, neighbor, or friend. Post your memory verse, or your child saying your memory verse, to social media (and tag me so I can see!). For younger kids, I recommend this Big Truths for Little Hearts set. For older kids, the Good News Story Set (also in Spanish! 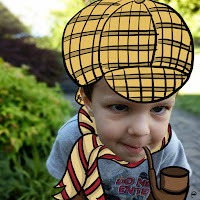 ), Identity, and Character would be great. This black and white set would be fun to watercolor on top of. 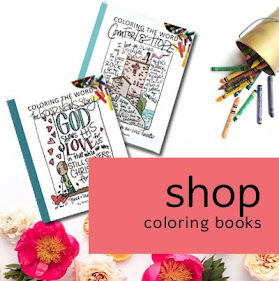 I'm going to encourage my oldest daughter (nine) to pick some verses from the Comfort and Hope set (which also comes in pre-printed cards). 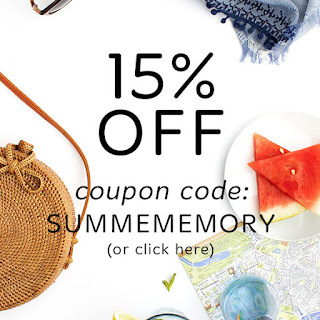 If you'd like anything from the shop, from now until June 20, you can use the code below (or just click on the image), for 15% off. 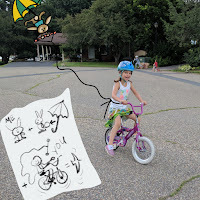 I'm not sure how much I'll be blogging this summer, but I do plan to revive my #marydeandrawssummer drawings for the second summer. We had so much fun creating these images last year and still look back at the book of them we made. If you'd like to follow along, I'll be posting on my Facebook page and Instagram. So, help me out here! 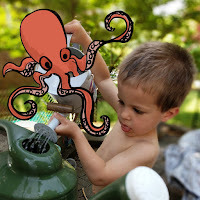 What do you do to stay sane in the summer? What kind of rythyms/routines have you tried or plan to try? Or, are you just as anxious as me?